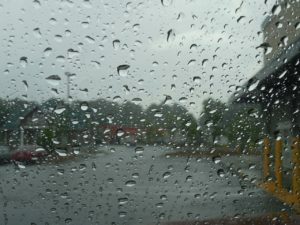 Spring storms in Northeast Wisconsin…This season we’ve already had one bout of spring thaw and rain causing flooding and water damage to homes and businesses in Northeast Wisconsin. Today we focus on preparing for spring storms. We know we are unable to control mother nature but we definitely can plan for it. After all, spring showers are inevitable. Review these 5 tips to prepare for spring storms in Northeast Wisconsin and protect your home and family. 1) Survey Your Home or Business and its Surroundings: Just like in fall, we suggest checking around your home or business in spring to identify any tree branches that should be trimmed back. Are there branches near power lines? If yes, contact your local utility company and let them know. This is not a do-it-yourself project. Next, survey the tree branches around your home or business. Are there any trees that have died or branches that should be removed? If yes, this may be something you can do yourself but if you are not comfortable, call in a professional tree trimming service. Next, take a look around your yard. 2) Home and Yard Cleanup: Take this time of year to remove debris from your rain gutters, downspouts, drains, and roof. The purpose of the rain gutters and downspouts is to remove the rain water safely from your home. Make sure those rain gutters and downspouts are attached properly and that they have not let go during the winter months. Downspouts are designed to lead the rainwater away from your foundation thus keeping the water from your foundation. From here, we suggest testing your sump pump. 3) Test Your Sump Pump: An easy way to test your sump pump is to lift the float of the pump upwards and see if it kicks on. If it doesn’t, check to make sure it is plugged in. Is your sump pump clean and draining properly? How old is your sump pump? It may be time to invest in a new one to make sure it can handle any spring storms and rain we receive. If you are unable to test the sump pump yourself or to determine if it is clean and draining properly, call in a professional plumber. It will be worth the time and money. Now that you’ve prepped what you can around your home, it’s time to make sure you have a plan in place. 4) Have an Emergency Family Plan: In a worse case scenario, would you and your family know what to do? Now is the time to create a plan when you are not in an emergency situation. If roads were to flood, how would you get to your home? How would you safely leave your home? Is there a shelter location that your family should meet if you are not all together? The American Red Cross has a nice resource for creating a plan if you do not currently have one here. 5) What’s In Your Insurance Coverage: It is wise to review your homeowners insurance policy and make sure that you have water backup or flood coverage included in your plan. Water damage and water emergencies can happen to anyone at any time. If you have a sump pump, it should be specifically covered in your policy. Tell your agent you want this coverage, it is worth the small extra cost! This coverage is often left out of blanket homeowners policies because sump pump failure is a big payout for insurance companies. Make sure to protect your home and belongings. At CCS Property Services we take water damage seriously. Preparing your home and family for spring storms is an easy way to stay ahead of impending weather that can likely cause flooding in Northeast Wisconsin. Use these tips as a starting point. If you sustain water damage, know that we are here to clean and remove the water from your home or business. We can help you get your property back to pre-damage conditions. Call us at 920.435.2288.